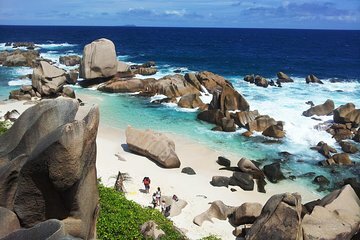 La Digue Island’s is known for its beaches, and many of them – including more secluded ones like Anse Cocos – are popular and can get crowded during the busy season. This full-day excursion takes you away from those guidebook highlights; instead, spend the height of the day relaxing and swimming at Anse Marron, an isolated beach tucked away between Grande Anse and Anse Source d’Argent. Follow your guide across challenging terrain and be rewarded with a pristine white-sand beach with an incredible collection of boulders in the ocean. Excelente excursion, tanto el camino como la playa son fantásticos, Gerard esta siempre pendiente de nosotros y ayudándonos siempre que lo necesitábamos, ademas de darnos mil explicaciones, un hombre muy divertido, amable y servicial. Imposible hacerla sin guia, tuvimos que recoger a una pareja que estaban superperdidos en mitad del camino. Recomiendo esta excursion al 100%.